The VP-81KSi is a high-performance analog step-in switcher for computer graphics video with resolutions up to WUXGA and unbalanced stereo audio signals. 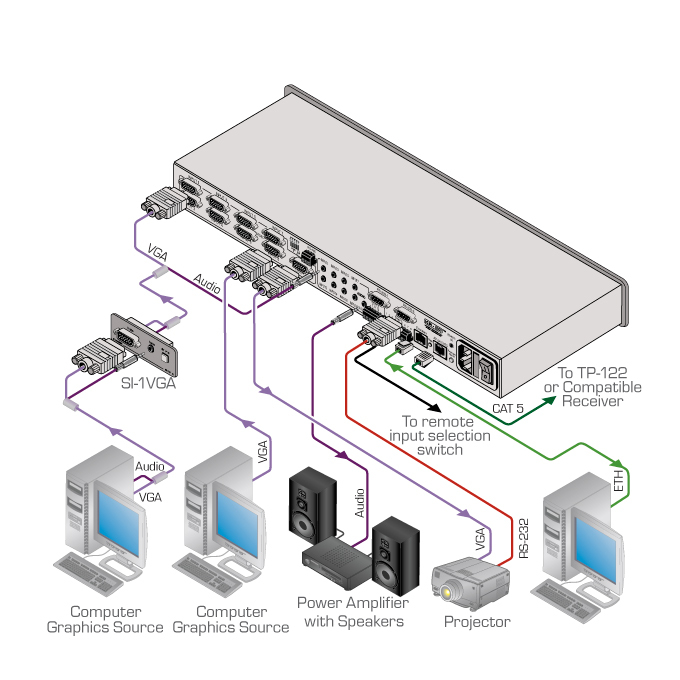 The unit can switch any one of eight inputs to one computer graphics video, one unbalanced and one balanced stereo audio and one twisted pair output. The VP-81KSi works in conjunction with up to eight VGA Remote Control Step-in Modules including the SI-1VGA (for TBUS-10), SI-VGAT (under the table) and WSI-1VGA (for standard TBUSes). High Bandwidth - 440MHz (-3dB), CAT 5 (Rec Out) up to WUXGA. Kr-isp Advanced Sync Processing - Ensures compatibility with a wide range of computers (even if the sync level is too low) by restoring the sync signal waveform. Remote Step-In Switching - Up to 8 users, connected through SI-1VGA remote input/switching step-in modules, can each step in to switch the input to the local remote PC. I-EDIDPro Kramer Intelligent EDID Processing - Intelligent EDID handling & processing algorithm ensures Plug and Play operation for analog systems. Multiple Unit Cascade - Cascades up to 8 units to create a "virtual" switcher of up to 57 inputs. Audio Switching Modes - Audio-Follows-Video (AFV) and audio breakaway switching. Flexible Control Options - Front panel, remote step-in panels, RS-232 (K-Router Windows-based software is included), RS-485, Ethernet via a built-in Web server, contact closure & IR remote (included).